Sonny (Jeremy Ray Taylor) and his best friend Sam (Caleel Harris) have started a company called the Junk Brothers. They will haul away any junk you don’t want, hoping to find some sort of hidden treasures among the garbage. With Sonny’s mom (Wendi McLendon-Covey) working double shifts, Sonny and Sam are left in the care of Sonny’s sister Sarah (Madison Iseman), who is focused on finishing her college application essay about fear. The Junk Brothers’ first customer calls them to clean out what turns out to be an abandoned house. While sorting through the rooms of items left behind, Sonny stumbles upon a hidden room inside a fireplace containing what looks to be a treasure chest. Excited about their find, the boys open the chest only to find an unfinished book and an eerie ventriloquist dummy with a card saying its name is Slappy (Mick Wingert). When the boys get home, Slappy comes to life, rightfully frightening Sonny and Sam. Slappy is able to move things with his mind, which the boys find amazing, if a little scary. Things start off innocently enough, but when Sonny’s science experiment goes haywire and Sarah’s boyfriend is involved in an accident at school, they start to suspect Slappy may be behind it. Little do they realize just how much trouble Slappy has in mind as he starts to bring Halloween to life. The second film in the Goosebumps universe, Haunted Halloween offers some spooky fun for younger audiences. Jeremy Ray Taylor and Caleel Harris are the focus of the film. Both do fine in their respective roles. Madison Iseman also does well as the older sister who doesn’t have time for the boys’ antics. Wendi McLendon-Covey, Chris Parnell, Ken Jeong, and Jack Black add to the humor of the film, as one would expect, but they aren’t given much to do. Jeong, as the neighbor who is obsessed with creating the most elaborate Halloween decorations, tries to steal the film but ends up causing more than his share of trouble. I haven’t seen the first Goosebumps movie, and as it turns out, you don’t really need to in order to see this one. Aside from a few call backs, primarily Slappy and a few ancillary characters, Haunted Halloween works as a stand-alone film. There are plenty of cute characters and scares that will keep kids enchanted, though it may be a little much for younger audiences. (My 9-year-old loved it, although she said it’s not quite as good as the original.) The effects are mostly well done, even if some feel a little cheesy. You have to keep in mind who the target audience is. 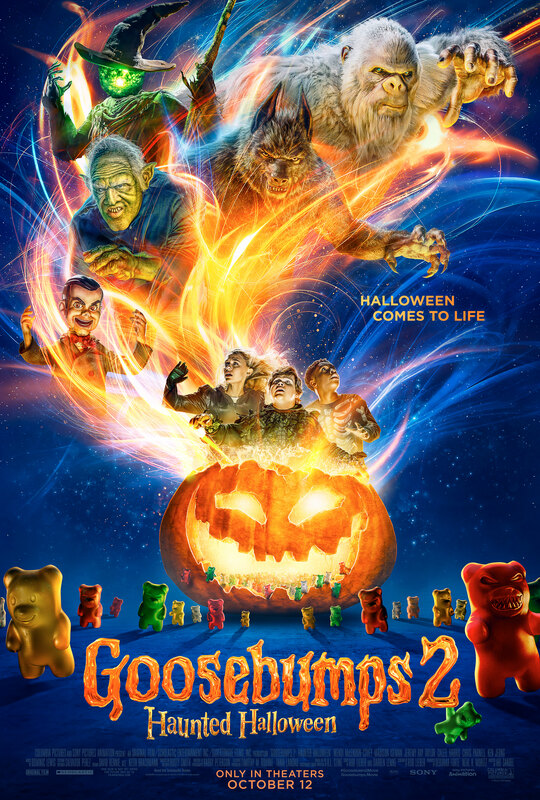 Goosebumps 2: Haunted Halloween is a spooky, fun film the whole family can enjoy. If you grew up on the books or have kids who enjoyed the first movie, it is a good pick for a night at the movies. Of course, you want to see it in the theater so you can catch it in time for Halloween.